Wesley Lau, a member of Conestoga’s men’s varsity volleyball team, is the first Conestoga student-athlete to surpass the 1,000-career point mark. 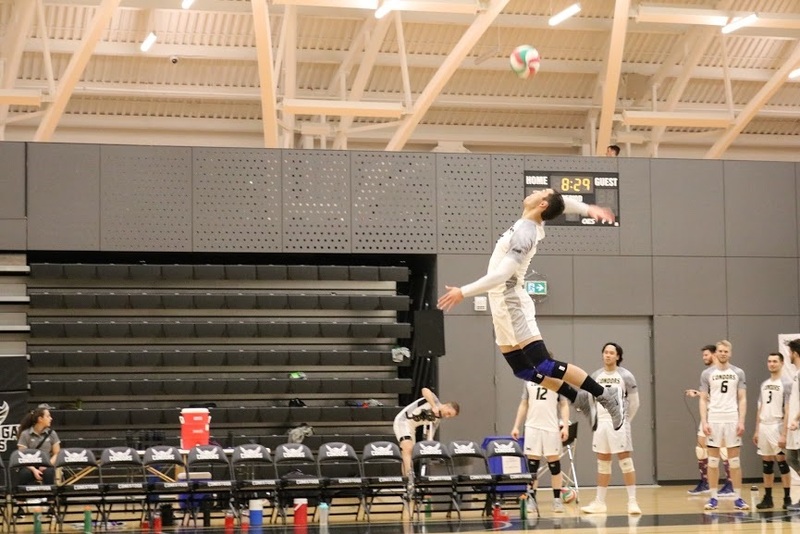 Varsity volleyball player Wesley Lau is the first Conestoga athlete to surpass the 1,000-career point mark, and is close to being one of the top five in all-time Ontario Colleges Athletic Association points. Lau, a student in the Bachelor of Applied Technology (Honours) - Architecture - Project and Facility Management program, and a graduate of the Architecture - Construction Engineering Technology advanced diploma program, plays left side and is currently in his fifth season with the Condors. In addition to surpassing the 1,000-career point mark, he is close to being one of the top five in all-time Ontario Colleges Athletic Association points, and has earned a long list of other accolades. He has been named team MVP four years in a row, was awarded Conestoga’s male athlete of the year twice, and in 2018 was a Canadian Collegiate Athletic Association (CCAA) Academic All-Canadian award recipient. As CCAA’s most prestigious student-athlete honour, the award recognizes commitment to academic success and athletic achievement. Lau has also received varsity athletic bursaries and a CSI-sponsored sports scholarship. Raised in Woodstock, Ontario, Lau first started playing volleyball in grade seven but, ironically, had more interest in basketball. “Volleyball was more of a side sport until college. I started to focus on volleyball at Conestoga because there was no basketball team five years ago and I really started to enjoy volleyball more,” explained Lau. Conestoga's Athletics and Recreation department offers programming and facilities designed to engage students and enhance their health and wellness through varsity and extramural athletics, intramural sports and fitness classes. The Recreation Centre at the Doon campus provides a full range of recreation and athletic services and houses a 35,000 square-foot fitness centre outfitted with state-of-the art equipment. In 2017, the centre received a Design Excellence Award from the Ontario Association of Architects.